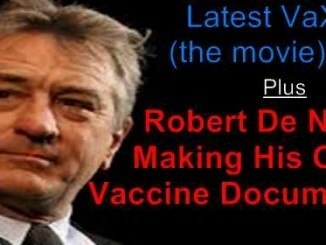 The fallout from the screening of Vaxxed being shut down by De Niro at the Tribeca Film Fest is huge and it could either be a defining moment for our community or an epic failure. For far too long we as non vaxers have tried to not upset those who are trying to oppress us and take away our rights. The bottom line is these people will never be happy until everyone is injected with a toxic stew of God knows what and every person is permanently disabled. We as a community have to be more forth coming, and we have to be willing to move the argument from online out into the real world. Nothing is going to change unless we are going to risk it all and educate every man, woman, child, teen, and grandparent we can get to listen. I am of firm belief that no one is too old or too young to learn and make changes. We have to move beyond talking about vaccines being bad and tell the whole truth that includes the very real benefits of natural immunity to the childhood diseases. As far as I am concerned we have one choice to pick up, reinvent and show up at vaccine clinics spreading truth, come out as non vaxers, and make the world know we are a growing majority not the minority. Take a look at how they are gloating over Vaxxed being shut down. As far as I am concerned these people are happy to see all arguments gone, free speech stolen, and only one side of the issue presented as is evidenced in the Hit Piece below . Cutting Andrew Wakefield documentary from festival is about drawing a line between bad science and dangerous science. Two minutes and 52 seconds later, when the propaganda reel for Vaxxed: From Cover-Up to Catastrophe fades to black, it’s clear this was a rhetorical question. We can divine the answer — “hell no” — just by skimming the IMDB credits for the upcoming documentary. Vaxxed was co-written and directed by Andrew Wakefield, a man who is now to medical science as a Keebler Elf is to nutrition. He believes the MMR vaccine, which inoculates against measles, mumps and rubella, is linked to autism. He’s been repeating this heresy since 1998, when he published a “study” in The Lancet that turned out to be as bogus as a three-dollar bill. A medical board excoriated Wakefield for acting unethically and manufacturing his conclusions. He was stripped of his medical licence. He was accused of attempting to profit from a global panic he helped create. He was forced to leave the United Kingdom for Texas. He unleashed a virus on his own reputation. Despite all of this, astonishingly, the discredited study remains a holy pamphlet for the antivaccination movement. Jenny McCarthy probably keeps a copy under her pillow. That study, that proof that never was, should mean Wakefield is a pariah. Instead, in some circles, he’s a martyr and hero. And in this unearned role of victim and visionary, he remains a public menace. But with no real access to laboratories, or even peer-reviewed journals, the former gastroenterologist is now a pain in the side of science as a documentary filmmaker. Vaxxed was scheduled to premiere at the Tribeca Film Festival next month. When word got out, the backlash was swift. On Friday, Robert De Niro, who founded the festival in 2002, defended his decision. On Saturday, he changed his mind and issued a statement. They are wrong on all points. This isn’t about free speech. It’s about costly ignorance. It’s about living at a time when diseases like measles were close to eradicated from much of the developed world and then returned. It’s about knowing when a “conversation” is called for and when there is nothing left to say. It’s about drawing a line between bad science and dangerous science. Wakefield is not just one of the most disgraced doctors of his time. By refusing to repent — indeed, by doubling down on his wacky idea — he’s become a Level 4 disease, a one-man threat to public health. He must be smart enough to know there is no causal link between autism and the MMR vaccine. If he truly believed otherwise, he’d have agreed to replicate his 1998 study using a sample size larger than, ahem, 12 children, some of whom it was later revealed presented with symptoms on the autism spectrum before they were vaccinated and some who no longer have any symptoms at all. But when challenged, Wakefield bolted. When other researchers tried and failed to reproduce his findings, he shrugged. Whatever his motivations now, the end result of this hoax is that many otherwise sensible people have opted out of immunizations and, unlike in other conspiracies, this impacts us all. Wakefield insists his only concern is the health of children, which must mean he has no concept of herd immunity. The real tragedy is that rates are rising for autism, a disorder that remains shrouded in mystery. There may well be environmental factors that warrant research and investigation. But the MMR vaccine is not one of them. And any alleged documentary that perpetuates this treacherous myth deserves nothing but a jab of contempt.